More than a few times on my recent trip to Taiwan the subject of Māori and indigenous migrations across the Pacific arose in conversation. According to a recent DNA study, the ancestors of New Zealand’s Māori people originally came from Taiwan. Evidence from archaeology, linguistics and physical anthropology indicates that the first New Zealand settlers came from east Polynesia and became the Māori. Language evolution studies and mitochondrial DNA evidence suggest that most Pacific Island populations originated from Taiwanese aborigines around 5,200 years ago; people who had earlier migrated from the Chinese mainland down through Southeast Asia and Indonesia. The traffic was light, but it was a Saturday morning and that would change markedly from Monday to Friday. I had only just arrived in Taipei after an eight-hour flight from Brisbane and it was already humid and hot at 7:30 am. After dropping my bags, thanks to an early check-in at the Howard Plaza Hotel, Jerry, my guide, had arranged a full schedule of places to visit as well as restaurant meals to devour. I was to soon learn that food in Taiwan is literally on everybody’s lips and that they rightfully consider their cuisine to be some of the finest in the world with an international following. However, my first taste of Taiwanese food was breakfast and it was not what I’d expected; yet it is a favourite with many Taiwanese. It consisted of a glass of cold soymilk, a salty tofu soup, a fried pancake with egg in a wrap with bits of ham coated in soy sauce, and an egg sandwich in a crispy bun. The restaurant was overly hot with no air-conditioning and only a large fan in one corner dispersing the heat of the ovens and gas burners. The probability is that life for small restaurant owners in Taiwan cannot be easy, as our Taiwanese breakfast for two cost under NZ $10.00. Jerry had studied his English in Hamilton and had stayed six years to gain his BA in film and photography from Waikato University, so his English was as good as you might expect. Shortly after our discourse on Taiwanese sports, Jerry and I arrived in the Manka district of Taipei, where the Lungshan Temple is located. It was just after 10:00 am and the temple courtyards were already teeming with worshipers saying prayers and bowing to different gold encrusted statues – all the while holding incense sticks – the smoke and smell of which were almost overwhelming. The temple was founded in 1738 and dedicated to the Buddhist Goddess of Mercy (Kuan-in in Chinese, or Avalokitesvara in Sanskrit). However, the temple of today is no longer the original building as it was rebuilt in 1919 after a major earthquake, and completed in 1924. Lungshan Temple has however kept its foundations in the Buddhist tradition but in the course of its development many deities of Taoism have also been introduced. The present temple consists of three halls: the first hall, the main hall and the rear hall. The first hall is used as the entrance and the space for the people to worship. The main hall is in the centre of the whole complex with a statue of Kuan-in, as the main god of the temple. Considered a masterpiece of traditional Chinese architecture and one of the best-established Buddhist temples in Taipei, the Lungshan Temple of Manka has become a centre of people’s religious life and a heritage of local culture. It was now time for lunch, and it seemed like everybody on the streets of Taipei was thinking similar thoughts. Jerry took me to a famous Dan Zai noodle restaurant, DuHsiao Yueh, (translated as a ‘slack season’) which is a fisherman’s term for very rough seas when they could not put their boats out, hence, a ‘slack season’. We waited for a table to become available by the entrance, where a cook seated in the front window at a very low counter prepared and plated all the noodle dishes. The main ingredient of one of the dishes served at DuHsiao Yueh, is a bowl of Dan Zai noodles which are covered in a pork broth concocted from pork ribs and pig bone which is cooked on a knee-high stove. 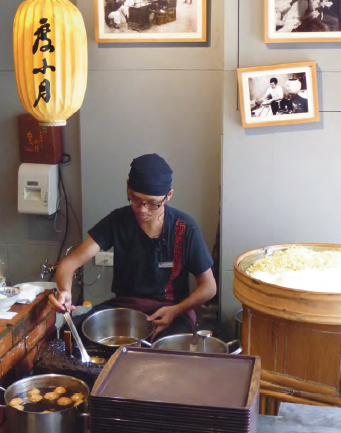 At the same low bench the cook blanches the noodles and condiments that are alongside a large pot of braised minced meat – a very familiar sight in all Dan Zai noodle restaurants. Our tray duly arrived with the noodles in the broth, with a mince pork covering and a single shrimp on top. 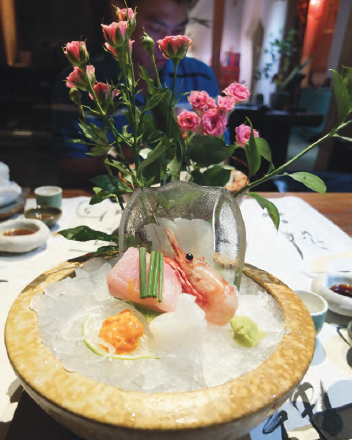 They also served shrimp cabbage, caviar and mullet rolls, deep-fried shrimp rolls, a milky fish soup, small egg tofu squares and delicious deep-fried oysters. After lunch we made our way to Taipei’s Huashan 1914 Creative Park. In 1997 a Taiwanese theatre company discovered what was then a derelict and abandoned old wine factory and distillery that was originally built in 1914. Over the years it eventually grew into a cultural hub with an art centre as local artists and the creative community used it as a workspace. When we arrived, whole families wandered its industrial lanes as a few professional photographers used the setting to capture wedding photographs of brides and grooms in striking poses outside the collection of concrete and red brick buildings. Inside, the industrial buildings now provide a space for rotating exhibits and events as well as housing 13 restaurants and cafes. It is also a venue for live concerts, music and theatre shows including hosting independent films and various local film festivals. The rest of our afternoon was spent in Taipei’s National Palace Museum. Covering a total area of about 198 acres, it is located in the outskirts of Taipei City. Construction started in 1962 and it was inaugurated on November 12, 1965. The impressive architecture is modelled on the Forbidden City in Beijing and incorporates elements of traditional Chinese royal design in feudal society. The building’s first, second and third floors are used for exhibitions, while the fourth floor is a lounge where visitors can rest, as on any weekend many thousands of visitors wander the galleries in tour groups. The National Palace Museum houses the largest collection of priceless Chinese artifacts and artwork in the world, including ancient bronze castings, calligraphy, scroll paintings, porcelain, jade and rare books, many of which were possessions of the former imperial family. The full collection, which consists of some 650,000 pieces, spans many dynasties. Each exhibit, however, displays only about 1,700 pieces at a time. At this rate, assuming each exhibit lasts three months, it will take 100 years to cycle through the entire collection! At 5:00 pm Jerry and our driver left the heart of downtown to drive 90 minutes to a very rural, yet traditional Taiwanese restaurant amid a baize of rice fields on the outskirts of Yilan on the east coast of Taiwan. By the time we had arrived it was dark. The Formosa Pearl Restaurant had huge oak doors and looked like a Chinese baronial manor house. In places antique furniture and sculptures adorned the long oblong room where I could hear the sound of light cascading water. We were then seated at a broad communal oak table set below chandeliers and separated by almost transparent swaying screens. Over the next two hours the Formosa Pearl staff served a seven-course tasting menu – the only choice available. The first dish was red caviar in a circle of mashed potato, mushrooms and cauliflower. It was followed by sashimi of giant prawns and tuna. The third dish was a filet of baked perch with baby tomatoes. 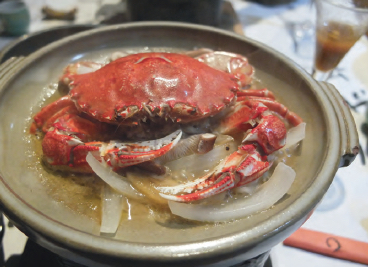 Then came a hotpot of mushroom, vegetables and Japanese udon topped with a big red crab. Next was a plate of beef ribs in a mushroom sauce, followed by a steaming chicken soup (often served last). By now I was more than full and satisfied, yet there was still a final dish of half a pear in sugared water with dates. Not to be outdone, the next day I visited Tower 101 as the sun was setting over Taipei’s seven million inhabitants. 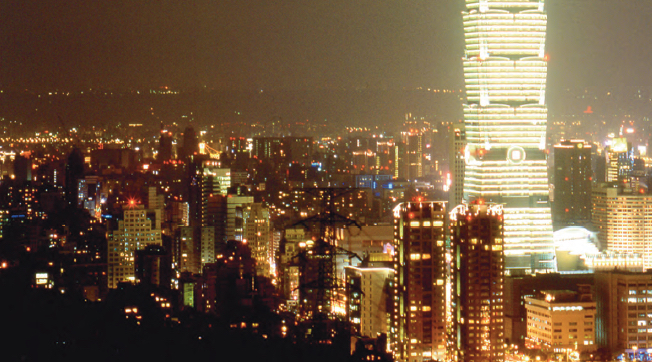 The city’s skyline is dominated by the 508m high Tower 101, so it was no surprise to find the tower’s observation floor is the number one tourism attraction in Taipei. Their claim to fame is the observatory’s pair of elevators, which hold Guinness World Records for the fastest passenger elevator that carries guests from the ground to the 89th floor with a speed of 1,010 m per minute. However, it was now time for dinner and the famous internationally recognised restaurant Din Tai Fung, famous for steamed buns or dumplings that originated in Taiwan, was located at the base of the tower. From the menu we ordered pork soup, prawns, shrimp, egg fried rice and shredded pork, and as I had become accustomed, another two hours later the last dish of spicy and sour soup was presented. It was time to head to the airport – I had eaten my fill once again – this was the last of my ‘Tasty Tales’ from Taiwan, another unique meal I’ll never forget. Tip: Green tea is the preferred choice in most hotel rooms, so make sure you pack your favourite brand from home. Milk is also not offered so I bought some from a 7/11 store, where beer and wine are also available. (There are over 2,000 outlets in Taiwan).